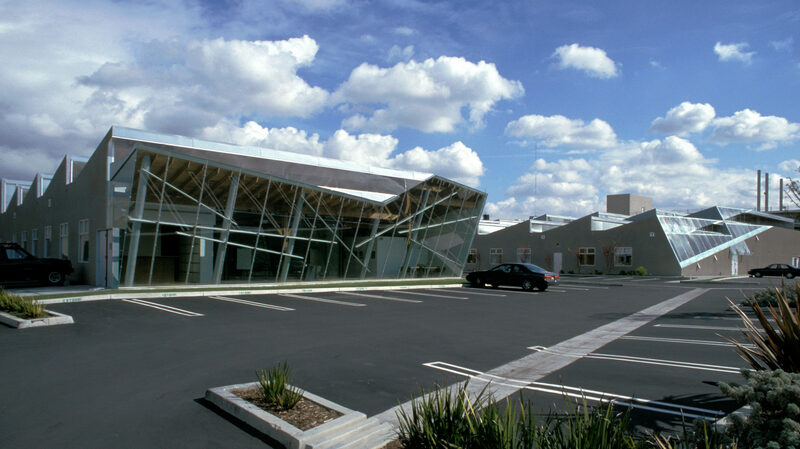 These two office buildings were originally part of a grouping of contiguous truss-roofed warehouses in Culver City that have been constructed, and added to incrementally since the 1940s. 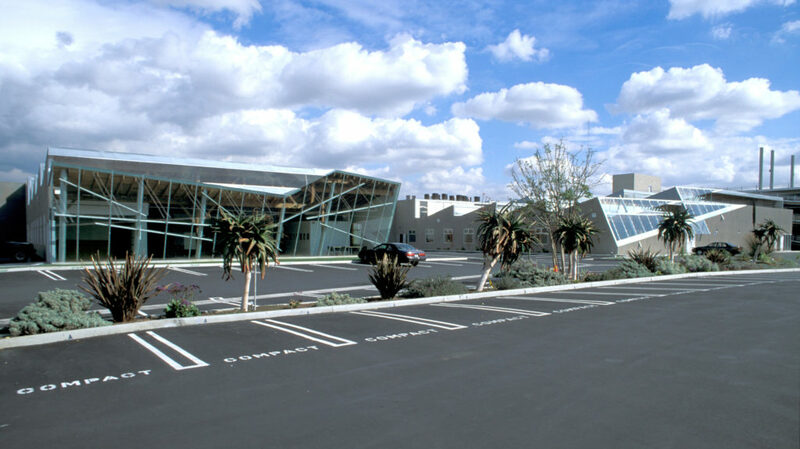 The design premise required a strategic removal of portions of a number of the original buildings in order to establish two discrete new building identities, to allow sufficient space for landscaping, and to accommodate both pedestrian and automobile circulation on the site. 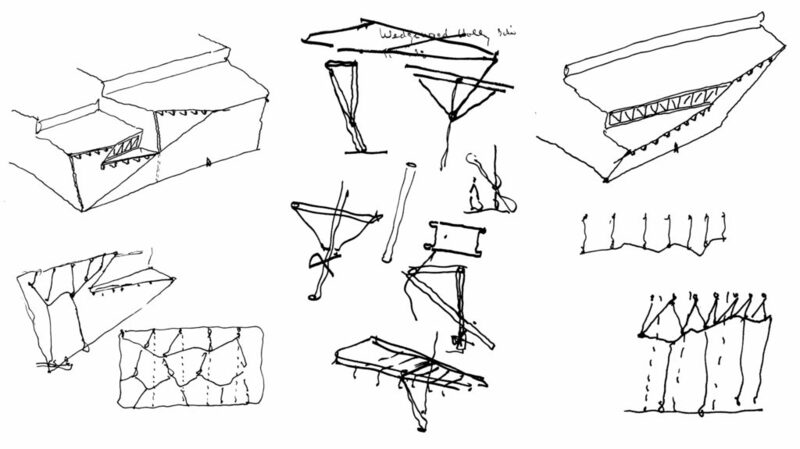 Having established the site plan location for the two buildings, a single conceptual gesture, clearly distinct from the design strategies of the surrounding projects, defines Slash and Backslash. The front elevations of the two structures are glazed where existing building fronts have been removed on an inclined diagonal slice. These defining cuts in the south/front elevation of each project are reciprocals. 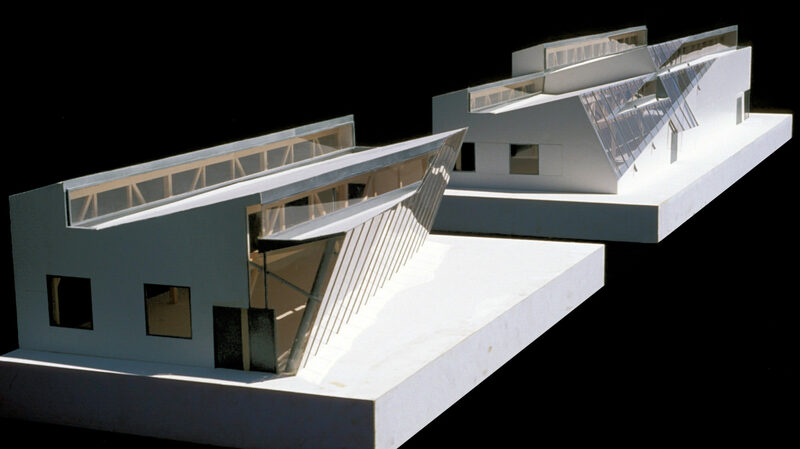 The first incision, Slash, leans south at the elevation roof and angles north at the foot of the new glass wall. Backslash reverses the direction of the incline, leaning from the southernmost extension at the base of the wall toward the north at the roof. The conceptual cut in both cases exposes the original wood structure – posts, wall, and roof framing – so the original structure simply hangs or extends, often unsupported, as a consequence of the removal of the existing building fronts. Where the remaining wood frame structure was unable to continue to support the walls and roof or to resist lateral loading, new steel pipes and braces were added to the façade. The conclusion is an amalgamation of both old wood structure and new steel structure, just inside the face of the new, inclined floor to roof, vertical mullion supported glazing. Perpendicular to the inclined facades, the enclosing side elevations were cut vertically from the existing structure along existing column lines, removing portions of the original buildings, and constructing new perimeter walls on old column lines. Large operable orthogonal windows were added, and the side walls were re-plastered. 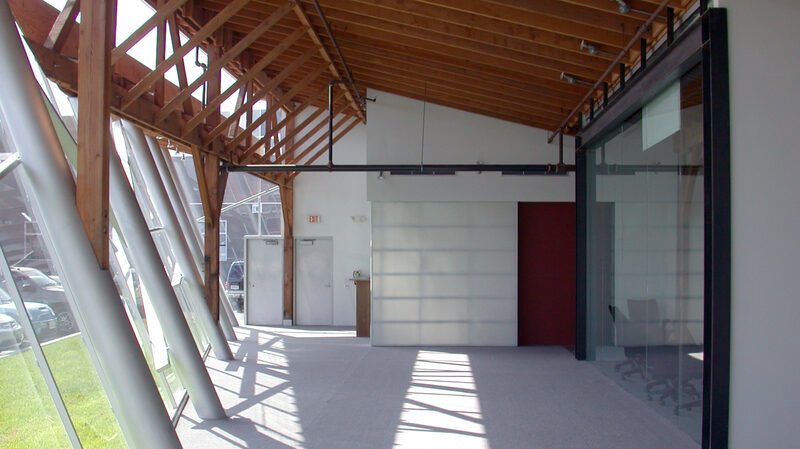 The interiors are large, open plan warehouse spaces, lit by original clerestory windows that face north on the existing sawtooth roof. The interior mechanical and power and data systems were located in a ducted floor grid, designed for maximum flexibility. A new steel frame was introduced on the interior, where required, to resist lateral loads and to support new mezzanine floors. Open space between the two buildings accommodates on-grade parking, pedestrian walks, and landscape. 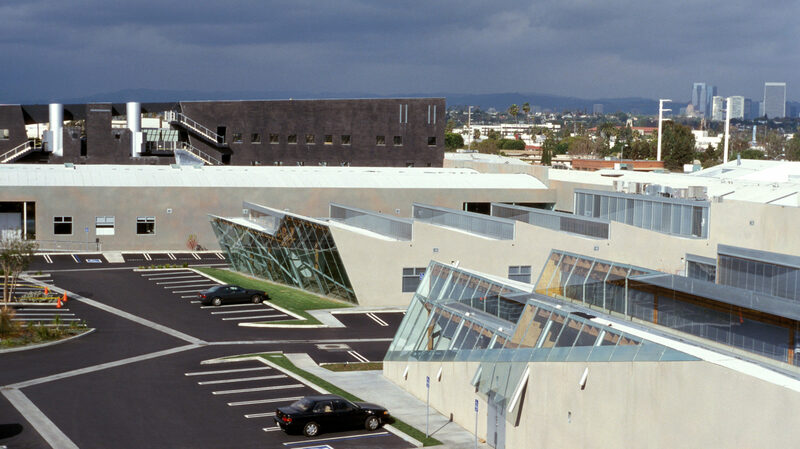 The inclined glass facades of the two buildings form the northern edge of a campus-like garden plaza.